Our Lady of Loreto is an ancient statue which stands in the Holy house of Loreto which is the house that Mary lived in when the Annunciation took place. The house, originally in Nazareth has moved miraculously several times. It now rests in Loreto, Italy where it has been for centuries. It is believed it was transported by angels and it is the oldest shrine to Mary in the world. The dark Lebanese cedar wood statue is said to be a faithful image of the Blessed Mother and not knowing its origin some even believe it was made by Saint Luke. Literally, over a thousand, maybe close to two thousand saints, and many popes have visited Mary in her holy house. 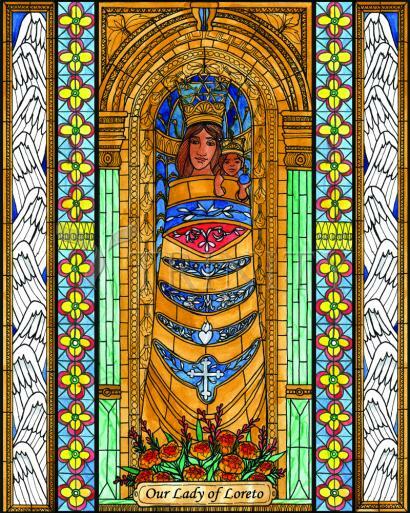 As you may have already guessed, numerous miracles are connected with this image of Mary and the Holy house. So many miracles have occurred that they are no longer even recorded. Her feast day is December 10. The most treasured and venerated Shrine of our Lady throughout the world is that of the Holy House of Nazareth in the Basilica at Loreto, Italy. And rightly so, for according to tradition, to testimonies of Popes and Saints this is where the "recreation"-----our redemption-----began. Over the past several centuries, people from all parts of the world have traveled to this shrine to pray and seek Our Lady's help. Thousands of miracles attributed to Our Lady have been recorded at Loreto. The tradition and history of the Holy House goes back to Apostolic times. From the earliest days of Christianity, the little house and the grotto which formed one side of the Holy House have been a place of worship and pilgrimage. Shortly after the year 313, Constantine the Great had a large Basilica built over the Holy House of Nazareth. The Holy House and the grotto formed part of the crypt of the new church. About the year 1090, the Saracens invaded the Holy Land, plundering and destroying many of the shrines sacred to Christians. One of these was the Basilica in Nazareth, but the Holy House and grotto in the crypt were left intact. When St. Francis of Assisi visited the Holy Land (1219-1220) he prayed at the Holy House. St. Louis IX, King of France, also visited and received Holy Communion in the shrine when he was leading a crusade to liberate the Holy Land from the Moslems. Another Basilica was built during the 12th century to protect the Holy House and offer ample room for pilgrims. This second Basilica was destroyed when the Moslems overpowered the crusaders in 1263. Again the Holy House escaped destruction and was left intact under the ruins of the Basilica. Finally, in 1291 the crusaders were completely driven out of the Holy Land and it was at this point in history that the Holy House disappeared from Palestine and made its appearance in what is now known as present day Croatia, where a most important shrine was erected, Our Lady of Trsat (Tersatto in Italian pronunciation). Tradition tells us that on May 10, 1291, the Holy House of Nazareth was raised from its foundations in Nazareth and transported by Angels across the Mediterranean from Palestine to Dalmatia to the small town of Tersatto. The pastor of the Church of St. George, at Tersatto, Alexander Georgevich, was puzzled by the sudden presence of what looked like a tiny church and prayed for enlightenment. His prayers were answered when the Blessed Virgin appeared to him in sleep and told him that this was indeed the Holy House of Nazareth where the Annunciation took place and it was brought here through the power of God. To confirm what she was telling him, he would be restored to health. At that moment, Father Alexander was cured of an illness which he had suffered for many years. With the Moslems taking over Albania in 1294 and the possibility of profanation, the House disappeared from Tersatto. According to some shepherds, it was seen on December 10, 1294, being borne aloft by Angels across the Adriatic Sea and came to rest in a wooded area four miles from Recanati, Italy. The news spread fast and thousands came to examine the tiny house which resembled a church. The House became a place of pilgrimage and many miracles took place there. Bandits from the nearby wooded area began to plague the pilgrims, so the House was borne to a safer spot a short distance away. But the spot where the House was finally to rest was still not settled since the two brothers who owned the land were quarreling. The House was moved a third time to the site it now occupies. The brothers became reconciled as soon as the House settled in its final location. Incidentally, wherever it landed, the Holy House rested miraculously on the ground, without a foundation. Once again miracles attended the presence of the House, and the townspeople sent a deputation of men to Tersatto and then to Nazareth to determine for certain the origin of the Holy House. Sixteen men, all reliable citizens, took with them measurements and full details of the House, and after several months arrived back with the report that in their opinion, the House had really come from Nazareth. Over the centuries, many Pontiffs have testified to the authenticity of the Holy House and the miracles that have been attributed to it. The devotion and respect of the Pontiffs for the Holy House may be gathered from the numerous indulgences granted to those visiting the Holy House. The first were granted by Pope Benedict XII, then followed by Urban VI who granted certain indulgences for the feast of the Nativity of the Blessed Virgin Mary. These indulgences were confirmed by Popes Boniface IX and Martin V.
…Wherever there is a genuine shrine of Our Lady or miraculous image, you may be sure there will be many miracles. This is particularly true at the Holy House, where there have been so many they no longer are recorded. In fact, three popes were miraculously cured at the shrine of the Holy House of Loreto. More than two thousand persons who have been canonized, beatified or made venerable by the Church have visited the Holy House. St. Therese of Lisieux made a momentous pilgrimage before entering the Carmelites, to which she alludes at length in her autobiography. St. Alphonsus Liguori, St. Frances Cabrini, Cardinal Newman, St. John Neumann, and St. Francis de Sales, to name but a few, have visited the Holy House. St. Francis of Assisi in the early years of the 13th century established a monastery at Sirolo, north of Recanati. To a group of puzzled friars, Francis foretold that before the close of that century, a sanctuary would be built near there which would be more renowned than Rome or Jerusalem and that the faithful would come from all over the world to visit this Holy Sanctuary. This prophecy proved true when the Holy House of Loreto arrived on Dec. 10, 1294.